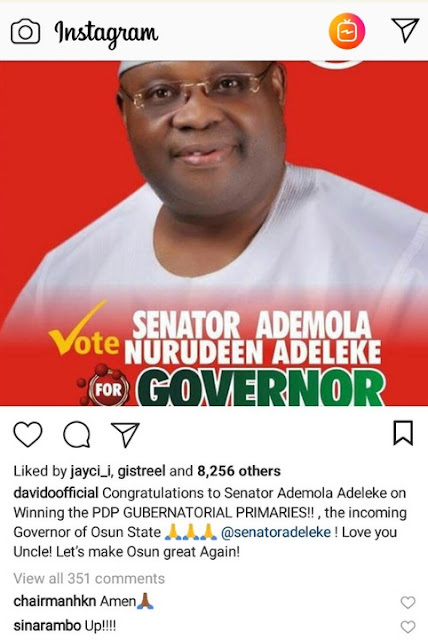 DMW boss, Davido has congratulated his uncle and B'red's father on winning the PDP Gubernatorial primarieds in Ondo state. Senator Ademola Adeleke who has been represemtung Osun State since 2017 was announced winner of the Ondo State PDP gubernatorial primaries earlier today. "Congratulations to Senator Ademola Adeleke on Winning the PDP GUBERNATORIAL PRIMARIES!! , the incoming Governor of Osun State @senatoradeleke ! Love you Uncle! Let’s make Osun great Again!"